Are you locked out of iTunes backup because of not remembering the password? You don't need to be sad if you are not able to unlock iOS 12 iPhone backup as there are few good working solution to overcome this issue. Generally, people use iTunes to backup all the data and content of their iPhone and for the protection they usually lock the iTunes so that no one gets hand on the useful data present in iTunes but sometimes the same protection can make them cry when they forget the password and can't access the iTunes. Read the article to know how to reset iPhone backup password (iOS 12 supported). It is really easy to reset your iOS 12 backup password if you still remember the password. This methods shows how to enter your original password in iTunes so that you can access encrypted iPhone backup without any issue. You just need to follow some of the steps in a sequence to easily get the encrypted data. Make sure that your iTunes is updated. Note: This method is only useful when you know the password. In case you don't remember the password simply jump to second method. 1. Open iTunes on your computer and connect your device using USB cable. 2. Click on device icon to see your device. [Device icon will be on the upper-left corner of the screen]. 3. 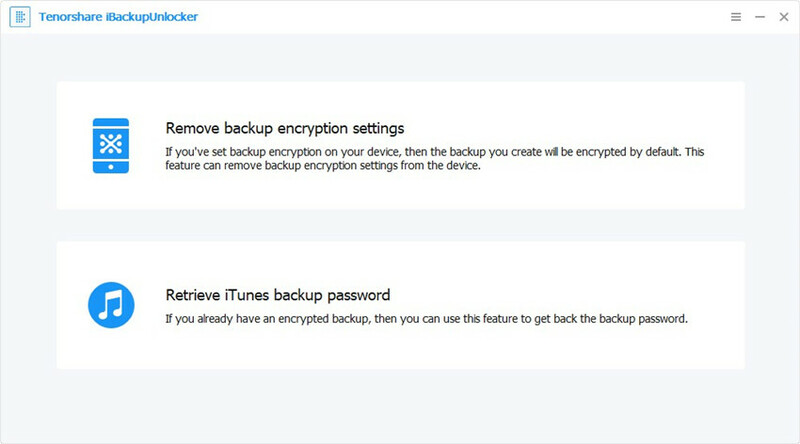 On the Summary screen uncheck the "Encrypted iPhone backup" option which you can find under Backups section. 4. You will see a dialogue box asking you to enter the Password. Just enter the password to unlock your iPhone backup and also you can reset the iTunes password now. If you can't remember you password anymore but really wants to get the data that is saved on your iTunes which is encrypted then Tenorshare 4uKey - iTunes Backup can solve your problem. This tool can safely recover forgotten iTunes backup password and quickly remove iTunes backup encryption settings quickly. It also ensure 100% decryption rate with 30X faster speed than the average speed. This tool uses 3 methods to attack iTunes backup and decrypt it easily. These three attacks are: Brute - force Attack, Brute - force with Mask Attack and Dictionary Attack. Note: Make sure to download and install 4uKey - iTunes Backup on your computer before you start the process. 1. Launch 4uKey - iTunes Backup on your computer. Click on "Add" button and then double click on the file you lost password from the drop-down box. 2. You will see 3 types of attack features on the screen to decrypt the iTunes password. These attacks are Dictionary Attack, Brute-force with Mask Attack, Brute Force Attack. Select one the option that you think will work in one shot. 3. Now click on "Start" option to find the password and decrypt it. It will take some time to decrypt the iTunes password depending upon the password complexity, length and attack settings. 4. After few minutes you will see a pop-up window showing you iTunes backup password. 5. In case this attack didn't decrypt the password, you use other two attacks which will surely decrypt your iTunes password. Users are now able to create a new encrypted backup of their device by resetting the password if they are using iOS 12. However, users won't be able to use the previous encrypted backup. This method is also useful in case you want to create new backup of your iPhone. Let's see how does this work. Note: Make sure to have the latest version of iTunes installed on your computer. 1. Open Settings on your device >> Go to General >> Tap on Reset. 2. Next tap Reset All Settings and enter your passcode. 3. Just follow the steps as show to you on the screen. This method won't affect data or password but some of the settings like display brightness, Home screen layout and wallpaper will be reset and also removes encrypted backup password.
. Now connect your device to iTunes and create a new encrypted backup. So, these are the top 3 ways to reset iOS 12 iTunes backup password. You can try anyone of the method to reset your iTunes backup password but if you want the best and reliable solution then go for 4uKey - iTunes Backup. This tool has 100% decryption rate as it uses 3 methods to attack iTunes which has the capability to crack any kind of password. It is also known as iTunes backup password recovery tool. Let us know which of the 3 attack feature helped you to know the password to unlock iOS 12 iPhone backup. Feel free to comment.